Will the unconditional love of his best friend be enough to help heal Percy after almost being broken mentally and physically? On Beasor, being a Gypsy gives Percy almost god—like status. His power over nature and animals could allow him to make a good living exploiting people, but he chooses to live with his best friend, Alden, over Alden’s pub in Catalai, the capital of Beasor. Percy loves Alden, but has never been able to tell Alden, afraid the truth would ruin their friendship. In a fit of jealousy one night, Percy travels through the universes to Earth, and finds himself captured by two humans. As a magical Beasor, silk binds him to their will and Percy finds himself close to breaking in every way as the humans drain his magic. When Alden rescues Percy, the best friends finally admit to their love, but Percy needs help to replenish his magic and find a way to ease the memories of his captivity. 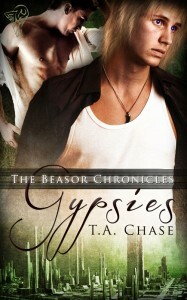 With Alden supporting him every step of the way, Percy fights to heal and become the Gypsy he was once. 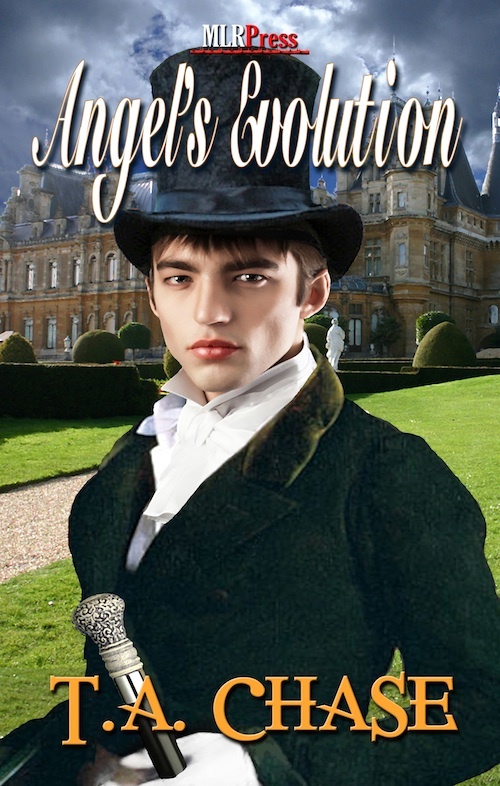 Angel’s Evolution was re-released on Friday by MLR Press. Click here to check it out. I missed announcing it last week. Sorry about that. I’m a monster, but with one kiss, he changes everything I believe. I’m a monster and I’m imprisoned in a world I hate and fear. As heir to my father’s title, I’m expected to marry, but my secret desires may keep me from fulfilling those expectations. One night, a stranger kisses me. In his touch, I see the possibility of a life beyond my prison. My name? Just call me Angel and this is my evolution. There’s just something about this guy’s eyes and smile that I love. I had to post it. You can find the rest of the series at Beautiful Magazine. They have some awesome eye candy photos, but most of them aren’t safe for work. Just keep that in mind if you visit…lol. I just got the news yesterday that Tramps, the second in The Beasor Chronicles, has been moved up to be released August 20th. Which means I need to get cracking and finish it up. The reason it’s being moved up is because Total e-Bound is re-releasing The Vanguard in September. Woo-hoo! I’m really excited about the whole thing because starting in July, I’ll have at least one book a month coming out from TeB, and in July, August, and Dec. I’ll have two books each of those months coming out. We’ve done our best to try and alternate new books with re-releases. So you’ll be getting something new from me every other month, plus all your old favorites with new covers. I have final edits to do on Pursing Hope and Angel’s Evoultion. Those will be done today, I’m hoping…along with other things I’ve been neglecting. Most of which are forms I have to fill out…lol. I did let you all know Angel is being re-released by MLR Press, right? Well, I think that’s all I have to say at the moment. I hope you all have a great Wednesday. Well, as those of you who visit my site might have realized I took back my rights to all of my books at Liquid Silver. I’ve been finding homes for them, and Total e-Bound has been gracious enough to pick up my Home series, and Stealing Life, so far. They’re looking at a few of my other ones as well. But unfortunately, Angel’s Evolution wasn’t a good fit for them, so I sent it to MLR Press and asked them what they thought. My awesome editor, Kris, has offered me a contract for Angel, which includes both ebook and print format. Yay! So Angel will have a new home and will also be in print. I can’t wait…lol. I have two more books planned in The Transformation Series (I had to come up with a series title when I decided to write two more books…lol) Devil’s Temptation and Shade’s Enlightenment. I’m hoping when my schedule opens up a little bit more closer to the end of this year, I’ll be able to write them for release some time next year. Once I get outlines written for them, I might be able to give you a better idea of when they’ll be out. Since it’s so close to the end of the month, I thought I’d let you all know what my news is. If you’ve gone to ARe, or really any of the 3rd party sellers-or to Liquid Silver Books website to look for any of my books published by them, you won’t find them. After four great years being published with them and working with them, I decided to take the rights back to all my books. The only two left with LSB at the moment are Where the Devil Dances, and Two for One. Because both of those are published with other authors, I had to wait the full 90 days before I could get those back. Which is fine with me. Again, I want to emphasize that my decision had nothing to do with Liquid Silver Books. They’re great people, and I loved working with them. I just decided it was time to move my books somewhere else. The purpose behind it is to consolidate my publishers and make it a little less of a search for you, the readers, to find my books. If I have them at three or four publishers instead of six or seven, it’d be quicker…lol. And the good news is Total e-Bound has decided to pick up the Home series and Stealing Life so far. The other books are under review with them. 🙂 So at the moment, I have release dates for them, barring any unforeseen problem. No Going Home will be re-released Oct. 15th, Home of His Own-Dec. 31st. Wishing for a Home-Jan 28th. Also, I have release dates for the last two books in the series, Leaving Home will be out Feb. 25th and Home Sweet Home will be out March 25th. Stealing Life will be out April 22nd. The other news is all of the Home books will be released in print as well. I added more to Wishing to get it up to the right word count for print. So that’s awesome news. Now I know you’re all probably grumbling about having to wait until next year for the last two books in the series, but at least you have actual dates to mark on your calendar to look forward to. 🙂 There are six more LSB books that TeB will be taking a look at to see if they want them or not. If not, I do have other options to publishing them, so they will be re-released at some point. I did a pre-release schedule from Total e-Bound that goes through April of 2013. That makes me happy, and it’s a schedule I can keep without pulling my hair out…lol. I finished From Slavery to Freedom on Friday, and sent it off to my beta reader. Once she’s done, and tells me everything I need to fix, I’ll get it in to my editor at TeB. FStF is scheduled to be released on July 31st. Woot! I’m working on The Deepest Cut at the moment, trying to get it finished as well. We’ll see how far I can get on that before I have to start the second book in The Beasor Chronicles trilogy. There are plans to take back some other books back from another publisher of mine, but until it actually happens, I’m keeping as silent as I can about that. 🙂 Again, I’m taking my rights back for no other reason than it’s time to move on. It’s been fun working with all my different publishers. Simply time to gather my little ducklings into fewer baskets. Let’s see…this weekend was good. I worked a little on Not Seeing, about halfway through now. Yay! Planning on adding a new story to my calendar this week as well. Have to figure out which one first. For those of you who ask, I’ll be working on Trailing Air, Rover’s story, start in May. Along with the next Sports story…possibly. Though that one might get worked on earlier than that. Depends on how fast I can finish a couple others first. Mars and Lord will be getting their own story. I’m hoping to schedule that on my work calendar sometime this summer. Along with a few other stories that have been sitting in my WiP files for a long time. Maybe it’s time to visit the Regency era again. I do plan on writing a story for Shade, but there’s another story that will come in between Angel’s Evolution and Shade’s story first before I get to his. I hope everyone had a great weekend…and have a marvelous Monday.